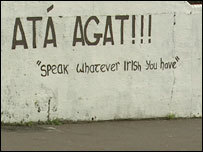 The Sinn Fein leader Gerry Adams is to demand an Irish language act when he meets the Culture Minister Edwin Poots. Mr Adams said he personally negotiated the Act at St Andrew's in talks with the Prime Minister and the Secretary of State. Now that Tony Blair and Peter Hain have moved on, the issue has fallen into the lap of the DUP minister. And Mr Adams had this message for Mr Poots: "There will be an Irish language Act, and it will be a strong Irish language act. The only question of course is when we will have it." But Mr Poots insists he is not bound by promises made by the Prime Minister. When it was put to him he was cherrypicking the act, he insisted his party did not negotiate the Irish language Act at St Andrews. He added it was up to his department to make recommendations but it was then a matter for the Executive and Assembly. "Ultimately we have to achieve cross-community consensus and cross community support to win this one," he said. Mr Poots has also accused Sinn Fein of using the Irish language as a political football. He pointedly told the BBC: "We need maturity on all sides. "We need people to be reflective and if individuals think they can use this as a political weapon and ram it down other people's throats, then that is not going to be an effective means of doing this." Before devolution two consultations on the proposed act were carried out. The first included around 670 substantive responses, not counting a 2,500 strong petition and 1,376 postcards. There was overwhelming support, but a small minority of responses were strongly opposed. A second consultation has been conducted which asks for opinion on indicative clauses in any Irish language bill. Sinn Fein and Irish language activists have criticised the second consultation - and complain about the sample clauses. Concubhar O Liathain, editor of the Irish language newspaper La Nua, said Irish language activists want the right to services in Irish but the draft indicative legislation is not firm enough in guaranteeing delivery. He says it is important that Irish language activists get their rights enshrined in legislation, once and for all. "For too long the Irish language has been subject to the whims and vagaries of political fortune," he said. "A right-based approach would make it part of the landscape... (with legislation) there is no need then to make the argument any more that we need these rights. "The rights are there and it's up to the state to figure out a way to implement them cost effectively and efficiently." But there is opposition among unionists to making Irish part of the landscape, with bilingual signs for example on government buildings. In the Protestant Irish street estate in Londonderry there was little appetite for such a change. While one woman said people may be open to learning, most were appalled. "No way," she said, while a man added that he couldn't see an Irish sign going up in Irish street. And members of Mr Poots own party have complained the Irish language is a waste of money. Even if the minister was minded to introduce the act, he has to get it through the assembly. David McNarry, an Ulster Unionist MLA who sits on the Culture Arts and Leisure Committee, said the Irish Language Act was "a political hot potato". And he doesn't see the legislation getting backing from unionists in the assembly. "No one on the unionist side is focussing and seeing the necessity of it. It's not a priority and it's not a necessity," he said. Mr McNarry also expressed concerns that republicans were "politicising" the Irish language legislation. Without unionist support the legislation will not pass the assembly, even if it gets through the executive. And already the culture minister is talking about alternatives to legislation as a means of delivering services for Irish speakers. "In the first instance, we have to decide if we are going for legislation. Is legislation required in the first instance?" he said. He said his department would adhere to its responsibilities but pointed out there were alternatives to legislation. He said this would be a matter for discussion and debate. The second consultation has yielded a remarkable 11,000 responses. The department is sifting through these, said to be varied, and the situation should become clearer by the Autumn.